Before you can start using the Ardumoto Shield, you have to do a little assembly. 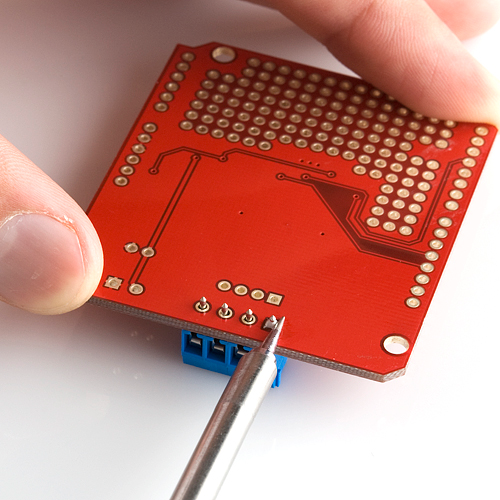 Embrace your inner electronics technician and whip out that soldering iron! Time to turn a mish-mash of parts into a fully-functional 'duino shield! On this page we'll go over some assembly tips. You don't have to follow these steps exactly -- assemble the shield as best fits your project's needs -- but this is good for general use of the shield. If you please, you can add screw terminals to both of the motor outputs and/or the VIN input. Then insert them into the shield and solder. 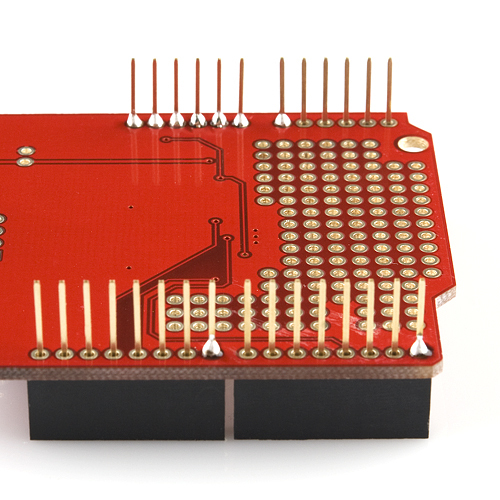 To interface the shield with your Arduino, soldering male connectors to the 28 header pins is a must. Soldering ensures a reliable physical and electrical connection. 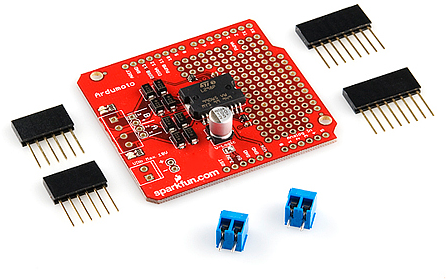 If you've never soldered before, check out our through-hole soldering tutorial. 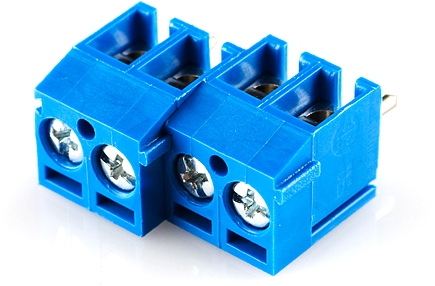 There are usually two options for connectors when you're assembling a shield: stackable or straight. 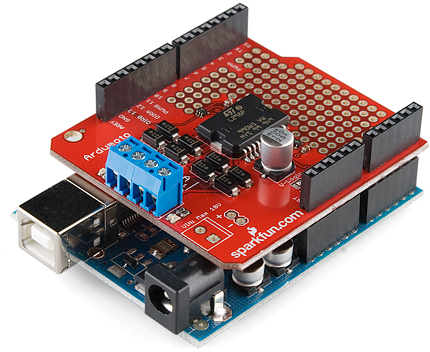 We recommend stackable headers, because it allows you to stack other shields or jumper wires on top. The smaller male headers are a good option if you're looking for lower-profile installation. If this is your first shield assembly, we recommend reading through our shield assembly guide. There are all sorts of tricks to installing shield headers, and making them look as good and straight as possible! In the process of soldering stackable headers. Still a lot of pins to go! Once you're done soldering the headers, plug the shield in to make sure everything fits cozily. Once you've figured out your motor placement, feel free to connect them to your shield. If you added screw terminals in the last step, break out your mini phillips screw driver. Otherwise, you may be soldering the motors directly to your shield. Let's address the elephant in the room. There's almost half-a-shield that we've failed to talk about thus far. The prototyping area! These rows and columns of 0.1"-spaced plated through-holes can be used to solder in all sorts of fun components. 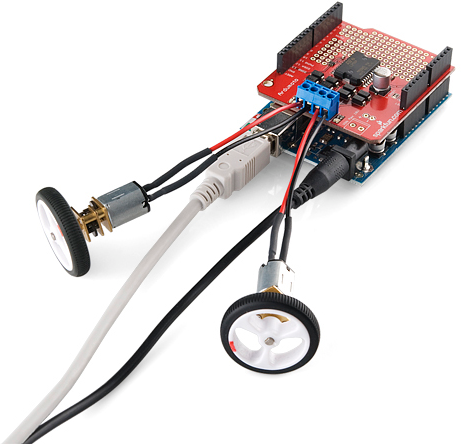 You could add an accelerometer to enable bump detection in your robot. Or just fill it with LEDs to make your project as blinky as possible. Or, if you don't have any plans for the area, leave it be -- maybe you'll come up with something later. Unlike other prototyping areas you may have encountered in the past, these holes are not wired together. You don't need to do any trace-slicing, but you will need to do some soldering and wire routing.